Specific details open up larger worlds. Generalizations do not. And they are no fun to write or to read. They leave no room for free floating associations. Readers glide over them and forget them a second later. Generic descriptions kill deeper responses to our writing. A writing teacher once told me, “Don’t write, ‘She wore jeans.’ Write ‘She wore old cut-off jeans that were tight across her tush.” Now that’s a comment that has stayed with me for twenty years. Specificity. Could this be the golden key that unlocks our imaginations and the imaginations of our readers? Go ahead, writers. Have a good time with specificity in your fiction, your essays, your descriptions. What details in your world have struck you lately? From a book? A conversation? A film? I Notice, Therefore I Am! Did you hear President Obama’s recent speech on racism? Politics aside, he used specifics that for me pierced like a laser. He was crossing the street one night and passed a parked car with people inside. He heard the click of the locks as he walked by. He was a United States Senator at the time. I imagine how that must feel and I am sick. I realize this would never happen to me. I imagine what this must feel like and I am sick. He was in an elevator and saw the lady next to him hug her purse in tighter and look away. I realize this will never happen to me. For several moments I “become” that man in the elevator and I feel sick. Specificity. It’s the writer’s magic wand. Have you ever noticed how poets use specificity instinctively? To me this painting is wonderful to look at not only for its artistic merits but for the clarity of the narrative. 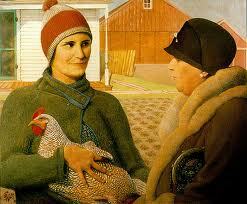 It’s so evocative of the American farm because of the artist’s attention to specifics. The furs, the hat pin, the jeweled bag, a city lady perhaps. In contrast to the wool cap and rough jacket of the farm boy holding his speckled hen. A few visual details and the whole story is there. The viewer is there too. Lovely and informative piece Cynthia. Thank you…with a red wheel barrow filled with white, puffy, slightly damp chicken feathers. Thanks so much Michael. William Carlos Williams and I love your riff!